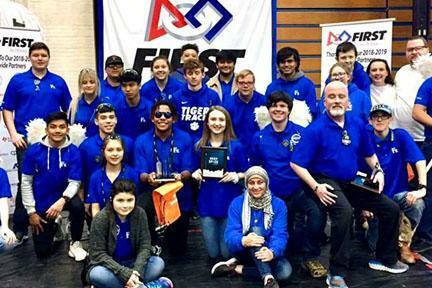 Frenship “Iron” Tigers Robotic Team, FRC 5866, competed in their first State Robotics Championship in Austin, Texas at the Palmer Event Center last week. With more than 200 teams competing, the Iron Tigers made the top 64 teams to compete for the State Championship. After four days of rough competition and minor bumps in the road to problem solve through, they ended up 47th in the state. The team walked away with valuable experience and are fired up to continue to build the program to the level of expectation needed to battle for the state title, as well as advancing to the “World’s Competition in Houston Texas” every year. 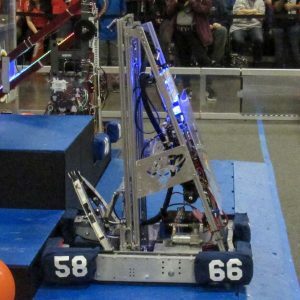 The Team ended the competition with a 4-8-0 match score with over 285 points scored in cargo, 106 points scored in hatch panels, 147 points in HAB climb and 165 points in sandstorm bonus. Matching head to head with top seated robots allowing them only to scrape by in 1 to 2 point lead. Earlier in the season they competed in El Paso District with a 9-3-0 and ranked 5th at the competition, advancing to the semi-finals with a 2-2-0 record. The team has also been awarded numerous other awards such as the Entrepreneur Award, Safety Award and Team Spirit Award. 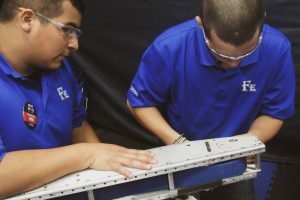 Witnessing high school students go out and fabricate a machine that will perform the required task along with a team of programmers, designers, business leaders and marketing technicians all performed by students is PROUD dad moment, not only for Coach Holloway, but the District as well. This group of student’s represented the Frenship Nation with Pride, Dignity and Passion. The Team’s goals are to continue to build a STEM environment throughout Frenship and the Lubbock County, planting and impacting the idea of the future along the way.